As you progress on your journey to find that perfect cup of coffee, you will quickly find that a coffee grinder is one of the required keys to unlocking the potential in your coffee beans. Perhaps even more important than the freshness of your beans is how well your coffee beans are ground to a uniform size so that the maximum flavor can be extracted from them. Coffee beans that are not ground uniformly mean that the resulting grind will contain a mix of powder-like grinds all the way to large chunks of beans. The problem with having this mix is the smaller grounds will be over extracted leading to a bitter brew, while at the same time larger grounds will be under extracted leading to a weak, thin brew. To remedy this problem, you want your grounds to be of uniform size. To get uniform sized grounds consistently you need a good coffee grinder. This article will help you select from the best coffee grinders available. Not so long ago, if you wanted a coffee grinder you went to the store and picked up an inexpensive blade grinder like the Krups Fast Touch Electric Coffee and Spice Grinder. You may have and still use one as they are rock-solid little workhorses. The Krups coffee grinder is a blade grinder. Blade grinders use a blunt, fixed blade, spinning at high rpm, to shatter the coffee beans into grounds. The problem with blade grinders is that they grind coffee very unevenly which, as you just learned, prevents you from extracting the maximum flavor from your beans. The other type of coffee grinder that has now made its way into many homes is the burr grinder. Burr grinders use two, serrated, metal or ceramic pieces that are positioned a certain distance from each other and rotate to crush the coffee beans into the precise size that you want. You probably are familiar with burr grinders as most pepper mills typically use a burr grinder. Like a pepper mill, coffee burr grinders allow you to adjust the fineness or coarseness of the grind. However, coffee burr grinders are much more precise and excel at consistently producing uniform sized grounds–which is exactly what you need to get the most from your beans. Burr grinders can be further categorized by type of burr (flat burr vs conical burr) and electric burr grinders vs manual burr grinders. The discussion between flat burr vs conical burr is outside the scope of this article but for all practical purposes there isn’t a significant difference. Electric vs manual is a matter of price and convenience and our list contains recommendations for both electric burr grinders and manual burr grinders. There are also pseudo-burr grinders such as the Cuisinart DBM-8 that are a kind of hybrid between a true burr grinder and a blade grinder. It uses a plastic burr mechanism with tiny steel blades instead of serrated edges and costs much less than a burr grinder. However, since the grind performance of this type of “burr” grinder is not much better than that of a blade grinder none of them made it on to our recommended grinders list. If uniform grind size for all grind types is your only criteria then the Mahlkonig EK43 could be considered the best coffee grinder. However, unless you have $2,500 burning a hole in your pocket it may not be the best grinder for you. The list below gives you a wide selection of great coffee grinders to choose from. One of them will certainly be the best coffee grinder for you. The best burr grinder is the Baratza Virtuoso Conical Burr Coffee Grinder. The Virtuoso was the first conical burr grinder released by Baratza and is still one of the best performing grinders on the market. 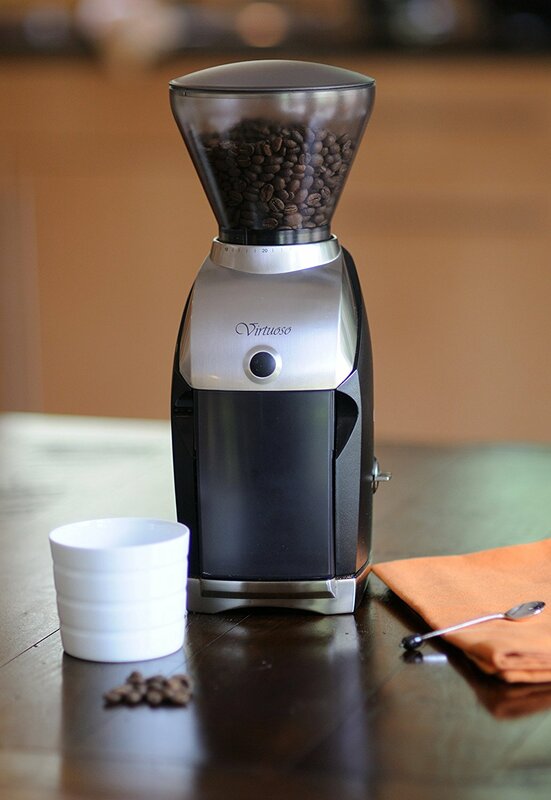 The Virtuoso’s grind consistency rivals that of the Mahlkonig EK43 especially for the medium and medium-fine grind types. Baratza is a U.S. company based in Seattle, WA and they only offer high-quality, state-of-the art coffee grinders for those who care about making the best coffees. Their dedication to the craft shows and the Baratza Virtuoso is the best coffee grinder for you if you are committed to brewing a perfect cup of coffee and are willing to invest in an excellent coffee grinder. The best burr grinder under $150 is another grinder by Baratza: the Encore Conical Burr Coffee Grinder. The Encore is the best entry-level grinder with grind consistency almost matching its older brother, the Virtuoso, but costing almost $100 less. The encore does not have the grind type range of the Virtuoso so it is not the ideal grinder for espresso but for all other grind types it does an excellent job. The Baratza Encore is the best coffee grinder for you if you want an excellent brew and don’t mind giving up a little range and consistency in exchange for a less expensive grinder. Once you start looking for burr coffee grinders under $100 you must be careful to identify the “false burr” types of grinders like the Cusinart DBM-8. If you are looking for a blade grinder then the Cusinart DMB-8 offers more features than you would find in a basic blade grinder but, make no mistake, it will not perform anywhere close to the burr grinders on this list. Just about the only burr grinder you will find under $100 is the Capresso Infinity Conical Burr grinder with a MSRP of $99 but it can be found on Amazon.com for $89 at the time of this article. Capresso is a market leader in innovative coffee equipment and a brand under JURA Elektroapparate AG of Switzerland, a global market leader in the premium segment of automatic coffee centers. Thankfully, the performance of the Capresso Inifnity is decent, especially considering its low price. The Capresso Infinity is the best coffee grinder for you if you want an all-around grinder that will make a great tasting cup of coffee but you aren’t obsessed with making the perfect cup of coffee. If none of the above grinders on our list seem to be the perfect fit for you or if you already have a great grinder and are looking for a portable option to take with you to work or on trips, a manual burr coffee grinder is the way to go. We have a tie for the best manual burr coffee grinder and they are both grinders from Hario, the Japanese company famous for the V60 pour-over brewer. The Hario Skerton Ceramic Coffee Mill and the Hario Mini Mill Slim Hand Coffee Grinder are both excellent performers and even outperform some of the electric grinders when it comes to medium and medium-fine grind types. Both are ceramic (longer lasting than metal) conical burr grinders but the Mini Mill is a slightly better performer than the Skerton and is a better travel grinder because of its acrylic grounds container and smaller size. The Skerton, on the other hand, has a larger, glass grounds container and conveniently fits on a standard mason jar for even more capacity. The Skerton was recently replaced with a new model with a stabilizer that improves its grind consistency but the model is too new to have any test data to support that claim. If you just want to see if a burr grinder makes that much of a difference or if you need a travel grinder then either the Hario Skerton or the Hario Mini Mill is the best coffee grinder for you. In spite what others may say, a blade grinder can still be a practical option for you. The Krups Fast Touch Electric Coffee and Spice Grinder can be purchased for under $15 and it’s a #1 best seller with thousands of reviews, the overwhelming amount of which are positive. If you enjoy coffee but think that all this talk about grind consistency, esoteric brewing methods, and $100+ coffee grinders is all a bit much, the Krups Fast Touch coffee grinder is the best coffee grinder for you. Paired with a good drip coffee machine and fresh coffee beans you can still make a perfectly enjoyable cup of coffee without dedicating your life to the pursuit of the perfect cup of coffee. The variety of quality coffee equipment that is available today is amazing. As you can see from our list, there is a grinder that will fit your needs. Are you an aspiring coffee connoisseur? The Baratza Virtuoso gives you a commercial quality grind for a fraction of the price. Do you take your love of coffee on the road? One of the Hario manual burr grinders and an Aeropress are the perfect traveling companions. Or do you simply want a good cup of joe? The Capresso Infinity is an incredible deal for a quality burr grinder. No matter what you choose, we at Freshpresso.net are always happy to accompany you on your coffee journey!